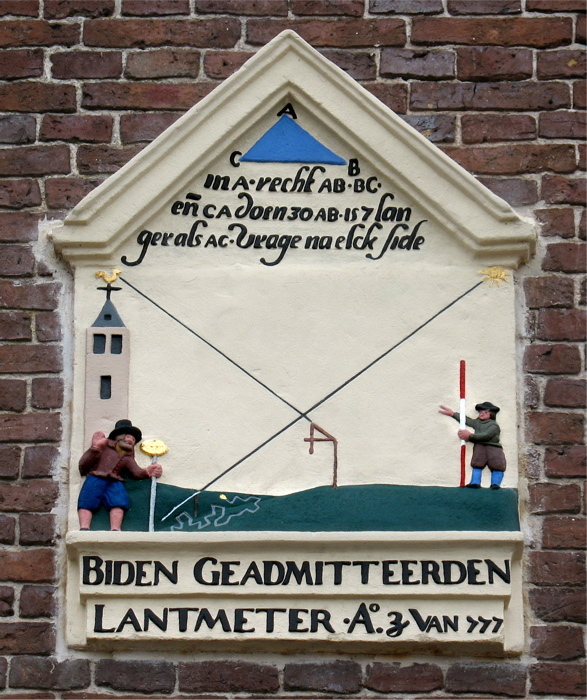 The picture opposite shows a tablet that the surveyor Sytske Gravius had put in the façade of his house at Raadhuisstraat 10, Grouw (Friesland, Netherlands) in 1655. 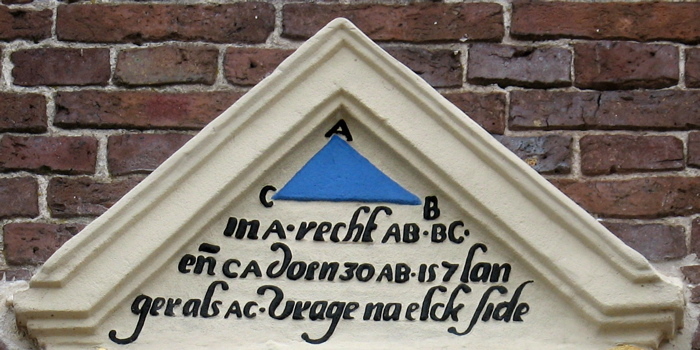 The tablet was made by a fellow-surveyor, Syoerdt Aetesz Haeckema, who was also a sculptor. At the time they were both working in the province of Friesland on an ordnance survey project for an atlas, which eventually was published in 1664. In 1926 the stone tablet was moved to the Rijks H.B.S. (a secondary school) in Drachten (Friesland) on the initiative of H.K. Schippers, who was at that time teaching Maths at this school. In 2007 it moved back to Grouw, where it can be seen again at Raadhuisstraat 10. In A recht. AB, BC en CA doen 30. AB is 7 langer als AC. Vrage na elck side. That means: "Angle at A right. AB, BC and CA total 30. AB is 7 longer than AC. How long is each side?" Two surveyors at work with their various tools. The man on the left is looking through a so-called Hollandse Cirkel or Circle of Dou, an instrument with compass and graduation to measure angles. At his feet are a sun-dial for measuring the sun's altitude and an unused surveyor's chain (each part of which probably had the length of one Rhineland foot). In the middle one sees a triangle put in the right position to determine the relative height of the church tower. On the far right stands the other surveyor, ready to indicate the measuring direction. Biden geadmitteerden Lantmeter. Ao z van 777. That means: "By the Official Surveyor - A. D. z of 777." The 'z' stands for square. The square of 777 totals 603729, which apparently gives us the date the stone tablet was put in the wall, since 603729 divided by 365 gives approximately 1655. The origin and meaning of the 'z', together with an explanation of this date riddle can be found in a typed manuscript (dated 1941) by the above mentioned teacher. The arabic word mal means wealth, but can also signify the square of a number. In medieval Latin, accordingly, the word census (literally measuring of property, tax) was used for square. In Italian this was written censo or zenso, abbreviated 'z'. Heinrich Wieleitner, Rechnen und Algebra, Berlin, Otto Salle, 1927. 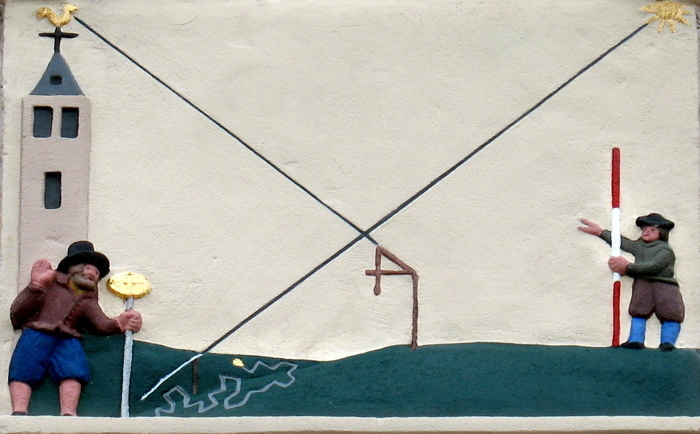 The picture of the tablet put back at the wall in Grouw which is used here, was made by Mieke den Boer-Snoei. I wish to thank the late Fred Ferro for much information. See also his article on this subject in the Dutch journal Monumenten 18 (1997), nr. 9, p.15, reprinted in De Hollandse Cirkel 4 (2002), nr.3. p.7. The nice collection of photos of gable stones made by the late Fred Ferro can be seen on the image bank of Dutch cultural heritage.